A place of worship that has been occupied for over a thousand years. 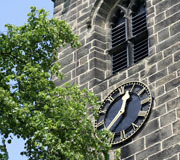 The building today is considered to be the most complete example of a 13th century church in West Yorkshire, even though it has undergone many changes. There is also a small family history centre for visitors to view when tracing family graves and records. 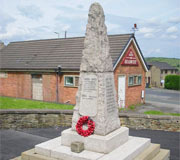 The war memorial is situated in the garden area in front of Birdsedge First School and next to Birdsedge Village Hall. The cross marks the site of the medieval market. It stands at the top of Far Dene at its junction with Town Gate and Hall Lane. The steps at the base probably date from the 14th century, the shaft and ball from the 18th or 19th. Burton Dean Park is on the site of the former Carter Mill. 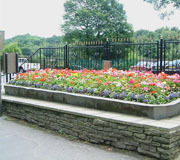 It is presently a small public open space, owned and managed by Kirklees Council, with assistance from the local community. 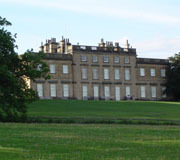 Cannon Hall Museum is located just outside the Denby Dale area, in Barnsley. For 200 years Cannon Hall was home to the Spencer-Stanhope family, who made their fortune in the local iron industry. In the 1790s the architect John Carr of York enlarged the hall and redesigned the interior. The house stands at the top of a beautiful country park, with wide-ranging views of the local countryside. 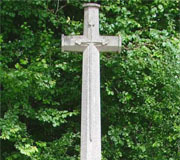 The memorial is situated at the junction of Church Lane and Holmfield Road. The famous Denby Dale Pies are a 220-year-old village tradition; usually baked to celebrate national special occasions and events. The giant pies have been registered in the Guinness Book of Records in previous years. The last pie was baked to celebrate the Millennium. 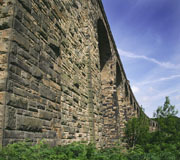 The railway viaduct is one of the main landmarks of the village, as it strides across the Dearne Valley carrying the Penistone Railway Line. The viaduct was constructed in 1846 as a wooden structure, opening in 1850 as part of the Huddersfield to Sheffield railway line. The present stone viaduct was built in 1879. 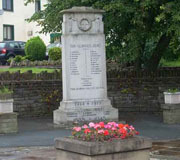 The village war memorial is situated in the small car park opposite the post office. Each year, the memorial acts as a focus of remembrance for the village to remember those who fell during the wars. 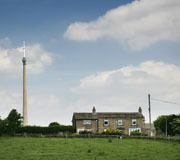 The Emley Moor Mast is a transmitting station which is used for TV transmission for most of Yorkshire. The current tower is the third structure to have occupied the site. It has a height of 330.4m (1,084 ft) and is the tallest freestanding structure in the UK. 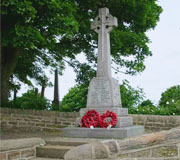 The war memorial is situated on Church Lane outside Emley Parish Church. 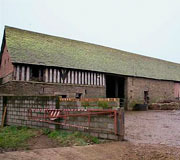 Gunthwaite Hall barn is a fine example of a medieval aisled barn. In such barns the nave is always significantly wider than the aisles. The reason for this is to provide a large floor area serving a multi-purpose function, incorporating both a storage area for hay and crops and stalls for cattle. 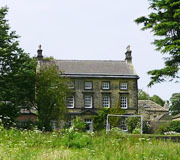 Huthwaite Hall was built by John Carr in 1748. The hall was built for John Cockshutt who operated the wire mills in Thurgoland. The hall consists of a complex of buildings including a farmhouse, brew house, stables and lodge, all now private residence. The site of an Iron Age village dating between 700 BC and 50 AD. Some of the things excavated from the Iron Age settlement can be seen at the Tolson Museum, in Huddersfield. 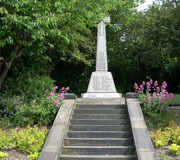 The memorial is situated in the Garden of Remembrance below Kirkburton Church, opposite the George Inn. It is a stone cross with a crucifix and statue of St George on a stepped hexagonal base with the names on the risers. This is off the A636 opposite the road to Emley, which was, at one time, a packhorse track to the parish church of High Hoyland. 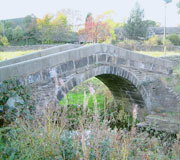 The bridge consists of one horse-wide masonry arches with low parapets, and was for many years the main crossing over the River Dearne. Quakers have met at High Flatts since the mid 17th century, as evidenced by the historic gravestones behind the meeting house. 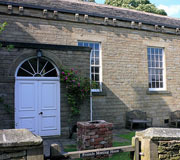 The present building is mainly 19th century in construction, and was the heart of an active Quaker village, with its own adult school. 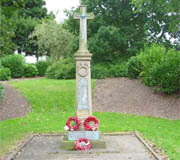 The war memorial is situated at the junction of Wakefield Road and Busker Lane. 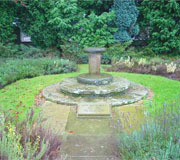 The memorial is in the shape of a cross with an octagonal base with inscriptions on the risers. 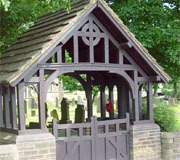 The memorial is situated in the lych gate of Shelley Emmanuel Church. 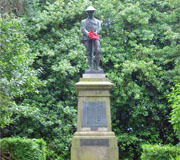 The war memorial is situated in the woodlands above Shepley Recreation Ground. It is signposted from the car park next to the Shepley Tennis Club, on Firth Street. The museum is preserved by local historians as a private Textile Heritage Centre, complete with hand loom and associated equipment. Although not able to open to the public, the Centre owners are happy to take guided tours for individuals or groups of up to eight people on a pre-booked system. 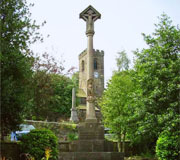 The war memorial is situated in Skelmanthorpe Cemetery at the junction of Busker Lane and Highbridge Lane. The owners of the nearby mill built Springfield House in the 1830s. It was bought by Kirkburton Urban District Council in 1935 and taken over as a town hall three years later. It is a Grade II Listed Building and is now a private residence with the grand, if inaccurate, name of ‘Kirkburton Hall’. 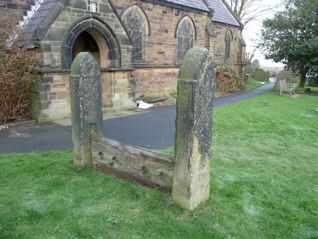 The memorial is situated at the junction of Marsh Hall Lane and ‘The Village’ in the centre of Thurstonland. It is a stone-built monument, standing approximately 15 feet tall with a wreath at the top, set in a walled area and surrounded by floral decorations. Formerly located to the south of Cumberworth Lane opposite the school and now near the entrance to the lovely St. Nicholas' Church in the village conservation area. This site has recently been taken over by The National Trust but still remains closed to the public. 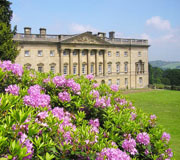 Wentworth Castle Gardens and Stainborough Park is located outside of the Denby Dale area, close to the M1. The gardens of the impressive Wentworth Castle have been recently renovated, and include formal gardens and landscaped parkland. There's also a newly restored Victorian conservatory, a visitor centre, gift shop, café and adventure playground. 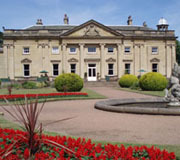 Wortley Hall is located outside the Denby Dale area, in Barnsley. 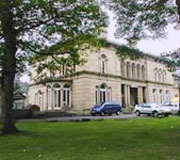 Dating from 1800, Wortley Hall is now a conference centre. The gardens are open to the public all year round. 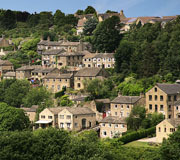 Wortley Top Forge is located outside of the Denby Dale area, in Barnsley. 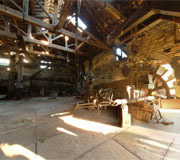 This 17th century iron-making forge is open to the public at weekends. It provides a fascinating glimpse of the only iron-making industry in the area. 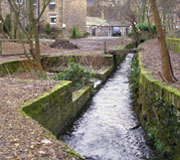 Close by are the sites of three wire-mills on Old Mill Lane in Thurgoland.